“Wonderful”—someone voiced, less as exclamation, more as testimony—that very inflection of the word capturing the essence of Kim Kashkashian and Lydia Artymiw in recital at Jordan Hall Thursday evening. Encountering the viola in Schumann’s Fantasiestücke, in a register higher than that of the cello, and facing an unexpected viola in a set from opus 34, originally for piano solo, put me in a kind of altered state. The Shostakovich was much more engaging with enrichment of the viola. Nothing was taken away from the piano part, but the viola was all over the staffs and absolutely participatory. The analytical eye blinded, no longer merely the observer, this reviewer became another participant in the musical lexes of both Kim Kashkashian and Lydia Artymiw and in their “wonder” of music-making. It was no poorly tuned pitch preceding the opening notes of the program, nothing tone deaf about it. A founding member of Music for Food, “a musician-led initiative to fight hunger in our home communities,” Kashkashian spoke. The case she made to help the hungry was simple, hopeful, and heartfelt. (If interested, click here) I had to wonder if my hearing this invocation engaged me as a listener—participant—during the concert. With the duo of Kashkashian and Artymiw, Shostakovitch and Schumann found kindness, depth, sensitivity, color, and compassion. All those unlikeable things you often wish were not part of the concert-going experience were blessedly absent. 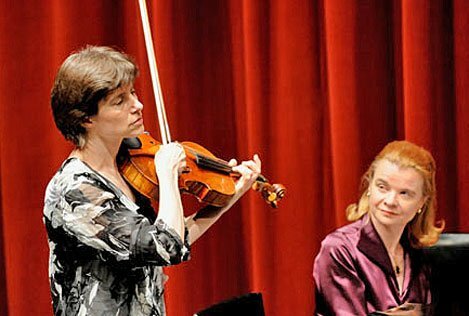 The brochure told us that “Kashashian has worked tirelessly to broaden the range of technique, advocacy, and repertoire for the viola.” Reading further, “Lydia Artymiw has a satisfying musical soul, “wrote Bernard Holland in a recent New York Times review. Understatements, both. The 12 of the Shostakovich’s 24 Preludes transcribed by Lera Auerbach and Schumann’s Fantasy Pieces added up to an only 30-minute first half of the concert—but what a “wonderful” half it was! After intermission came Shostakovich’s long, three-movement Sonata for Viola and Piano, opus 147, filled with ruminations of moonlight and Beethoven. Kashkashian and Artymiw played impeccably and humanly, the Adagio’s passages of extended darkness were broken up by hints of light. These two musicians focused my analytical eye on music’s broad power to transmit meaning. Their encore gave the evening further voice. Kashkashian and Artymiw embraced the Argentinian yet universal language of Carlos Guastavino’s Se Equivoco la Paloma (The dove was mistaken)… mistaking the wheat fields for the sea, the south for the north, and the face for the body… We were reminded: who, among us, has not taken that “wrong” turn that defines our destiny? The viola-piano duo expressed this notion with such enveloping, bittersweet conviction, that we were rendered human, touched most honestly, most beautifully. I agree with every word of David’s review. It was a glorious concert. I hope Kim’s brief mention of Music for Food got the audience’s and these readers’ attention. Kim has worked tirelessly for this musicians’ initiative against hunger, and four times this year they have put on fabulous chamber music concerts. People are asked to pay what they can, and all proceeds go to the Greater Boston Food Bank, which is more in need than ever. Their next concert is April 15 at NEC, and will include more Argentinian folk songs, which Kim played so artfully at this recital. As Ms. Kashkahsian noted after the Shostakovitch/Moonlight concluded, ‘it is quite difficult to play anything after this’. I enjoyed Gustavino’s Paloma song, but the end of Shostakovih’s last opus, fading away, made me feel “and then he was dead” and this was the absolutely perfect end to the performance; encores are not always necessary. The load of emotion, wisdom and talent we received earlier were awesome and plentiful.